The Crop Circle Phenomenon is arguably one of today`s strangest enigmas. Ranging from some aficionados claiming divine intervention, to others indulging in the creation of “landscape art”, so called `Croppies` cover a wide spectrum of personalities and interests. Thought by many to be a recent phenomenon, it is now known that crop circles have been appearing at least since medieval times. While some early records have blamed the devil, the 20th century happenings have largely been ignored until the last decade. Many were seen during World War II by low-flying Battle of Britain pilots – although at that time other matters would have taken priority. It was only in the 1980s that any real investigation of the phenomenon began. At this time, formation shapes were very simple, principally simple circles, and sometimes annuli. Many investigators saw it simply as a geophysical phenomenon, linked principally to local weather effects. It did become apparent, however, that other factors were involved. 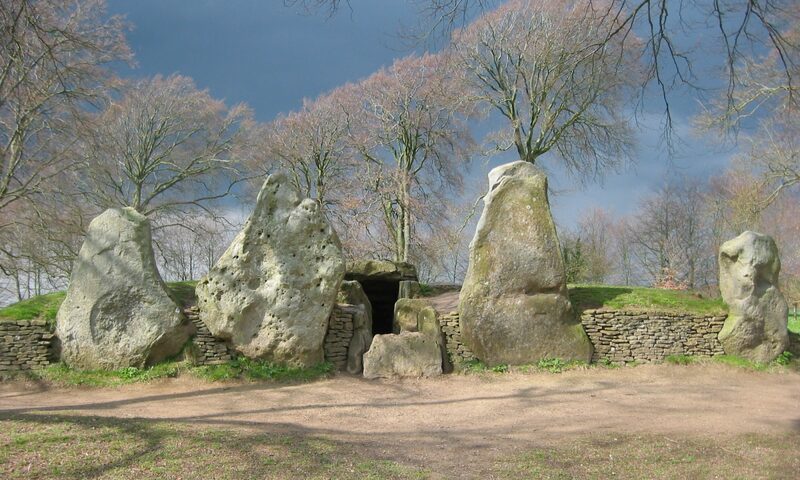 Not least was the observation that the location of the formations was more often than not associated with ancient sacred sites such as Stonehenge and Avebury. The Wiltshire area became the prime location. In addition to their mere appearance, other effects soon started to emerge. Among the more bizarre were the occurrence of floating balls of light (in size usually a few inches to a few feet, but occasionally much larger) seen either within or above the formations and often at night over the place where a circle would subsequently be formed. Occasionally were heard high-pitched sounds, which came to be called “trilling” noises. Perhaps the strangest of all these observed effects was the apparent link of the formations to people`s interest in the phenomenon. This appeared to be a classic case of synchronous events which not only had implications for the locations of the formations but also the shapes which eventually manifested. The appearance in 1990 of the famous Alton Barnes Pictogram caused something of a stir, since for the first time, it became obvious that there was more to the phenomenon than at first appeared. The mainstream scientists involved up to that time declared these new patterns to be outside the realm of geophysics, and so their interest declined rapidly; while the media initiated its well known derogatory campaign attributing everything to the plank and rope brigade. That year also saw the formation of the Centre for Crop Circle Studies, an organisation with the aim of trying to unravel the many conflicting features of the Circle Phenomenon. However, it was 1991 that revealed the truly innovative formations which stirred my own interest into becoming an active researcher in the topic, as opposed to being merely an armchair observer. The serious research work which had been done on formations up to the early 1990s identified a number of features of the real (as opposed to manmade) formations which, now with the hindsight of a decade`s further investigations, can be well substantiated. Their links to ancient sites have been well established. The vast majority occur on or near ancient routes over chalk downs. A study by Steve Page and Glenn Broughton1 has convincingly shown that underground water associated with these chalk downs is a key feature to the location, both of ancient sites as well as most crop formations. The exact placing of a formation is further dictated, very precisely, by what is termed `The Earth Energy Grid`. This refers to a network of energy lines associated with the earth. It has been referred to in literature since at least the time of Pythagoras. These essentially N-S, E-W lines are known to be strongly correlated with the Sun/ Earth magnetic field interaction. They form the basis of all sacred sites prior to the Reformation. These sacred places, be they Pagan, Christian, Aboriginal or any other culture are always built on places where these lines cross over. At certain specific sites, patterns of energy occur which form what are known as spiders’ webs. These have both radial lines and equi-spaced rings, which together form the pattern well described by their name. How do we know these patterns are there? This is an important part of the fundamental link of Man to Earth; for his ability to detect these shapes within the earth, using his own conscious processes, has much to do with the origin of the world of the Sacred. The technique used to detect and track these earth energy patterns is the ancient art of dowsing, which was certainly well known to the Egyptians. Better known in latter days for its use in water divining, it is used for many other purposes, including finding missing persons, and as a diagnostic tool in healing2. The earth patterns, detected mainly in this way, lie at the origins of Sacred Geometry. They can be found in manifested form in many places around the world – perhaps most clearly in the siting of medieval churches. This Grid Network of lines and geometric patterns is known to move in a cyclical fashion in response to the Sun’s progression around the ecliptic plane. An energy line is essentially a grouping of five dowsable lines and resembles a road with its double white lines at the centre, the road edge and, beyond the pavement edges. The movement is as a unit always returning to same location on the ground with the road` widening at the Equinoxes and Solstices. In particular, at the Solstices when the earth tilt axis relative to this reference plane is such that the induced E-W component of the sun`s magnetic field reverses direction, the whole earth grid pattern collapses for around one hour then slowly builds up again during the next few days. Thus one`s ability to dowse earth energy patterns during the solstices is severely impaired. This human/earth energy link is a central feature of Goddess-based religions and is clearly a key factor in the origin of the calendar year. As for ancient sites, and Crop Circles in particular, this earth grid pattern of magnetic origin represents the `graph paper` on which all formations are created (see Fig.1). The link between earth energy lines and Stone/Crop Circles has been examined in some detail by the late Richard Andrews: a very fine dowser, whose fundamental studies in this area3 have been confirmed and extended by many subsequent investigators, including myself. Other basic features of Crop formations can best be understood by reference again to Stone Circles. This time, we will use Avebury as an example to identify other major factors. A glance at a map of Avebury, stripped of its latter day buildings and roads with locations of its original stones identified, reveals several significant features (see Fig.2). Firstly, although we talk of Stone Circles, Avebury is not in fact circular, but rather ovoid in shape. This indeed is consistent with the geometry of all other Stone Circles in the British Isles, studied in some detail by Alexander Thom4. It also has a ditch or henge to give it its correct name. Today, this is filled in to some extent, but what is clear to dowsers is that the earth energy detectable along the lines that intersect the henge also flow around the ditch, much like traffic flowing around a roundabout. The energy can therefore be seen as a container for a doughnut shaped energy field, half being above the ground, and half within the ditch itself. The technical term for this shape is the toroid, well known in the realms of science as a shape which conserves energy. It is for example the shape of the van Allen radiation belts which surround the earth. In a henge, the earth energy flows around the toroidal pattern as a spiraling wave, much like wire wound on a toroidal bobbin. The direction of crop lay follows the direction of energy flow in the ground. The third feature of Avebury we need to take note of relates to the geometry of the stone locations. The central stone circles within Avebury are lined up relative to true north at a precise angle – 19.5 degrees, while the transverse axis of the whole formation is also lined up relative to north at this angle. These figures are very significant, since they are also found all the time within Crop Circles! They refer to a common feature of the flow of the earth`s subtle energy which is related to one of the Platonic solids, well known to students of Greek geometry : the tetrahedron (see Fig. 3). This is a triangular pyramid with sides of equal length. It is also related to the cube, being derived simply by joining all of the cube’s vertices diagonally rather than along its edges. To summarise: the basics of all crop circle geometries are to be found in (a) the toroid, (b) the resulting dual tetrahedral structure which is characterised geometrically by specific angular alignments in the resulting patterns, (c) the oval or egg shape, which can also be shown to be related to both the the toroid and (d) the vortex shape, as seen in a tornado. It is the vortex which is the key to the dynamics which finally create the circles. We have seen from our study of Stone Circles that their shape can vary significantly from a circular shape. Crop Circles on the other hand are generally closer to being circular although, apart from man made formations, I have yet to come across one that is truly circular. Many of those occurring in the eighties were simple ovals with the crop swirled in a well defined spiral flow pattern, often taking one revolution of the formation to reach its outer edge. The vortical centre, i.e the “centre of swirl”, of the energy field is often slightly offset from the geometric centre. This offset is related to the degree of asymmetry of the formation. To understand the crop flow pattern, imagine a toroidal shape aligned with the circle (see Fig. 1 for clarification) but, as in the case of Avebury, half above the ground and half below ground. This “shell” of energy is related to the earth`s magnetic field and forms what I term a “magnetic cloche”, within which the air, once it is ionised by the initiating electrostatic fields, flows in a helical motion. This simple model of what is going on is often more than sufficient to account for the crop flow pattern. It appears that the flow is initiated by the main earth energy lines which traverse the formation. The direction of flow in the circle is then related to the direction of energy flow in the main earth energy lines which cross it. In fact the whole thing seems to obey the same laws that govern the direction of rotation of electric motors! Generally, for a simple shape, one revolution of flow is sufficient to create the resultant shape. There have, however, been a few formations where two revolutions of flow are needed to create the final pattern. More complex patterns make use of the already existing dowsable earth energy patterns within the ground. In this case, imagine the cloches more as hemispherical bubbles which coalesce according to well established laws in physics. The individual bubbles permit very complex local flow of ionised air within them thus potentially creating subsequent complex crop flow patterns on the ground, often of exquisite elegance. All of these shapes derive from a basic toroidal template which undergoes a bifurcation process. This means that the original vortex breaks up into several smaller vortices having well defined geometrical sub-shapes. The combination of flows from all the vortices generated create the final pattern on the ground. For formations having large and small elements in combination, this process suggests the larger elements of the formation are laid first, followed by greater detail as the bifurcation process proceeds. The precision and complexity of these patterns of movement of ionised air (plasma) can only be understood in terms of recent research in plasma physics. The plasma state is naturally unstable and short-lived; thus the whole process is complete well within a minute, as has been attested to by a number of eye-witness reports. This overall generating shape can be programmed to bifurcate into innumerable patterns in a manner suggestive of cell division. It is also closely related to the universal vortex shape found in tornadoes and whirlpools. We now know that the dynamics of the vortex is relevant to all cosmic bodies, from the spiral shape of galaxies to the black holes at their centres. In addition, from Fig.4, we can identify the origin of the very significant angle of 19.5 degrees. This now explains many features of planetary bodies, such as the location of the Red Spot on Jupiter at 19.5 degrees below the planet`s equator. On earth, it accounts for the latitude of the volcanoes on Hawaii and, as a geophysicist colleague of mine discovered, the location of volcanoes in Mexico, together with the positions of the Mayan pyramids! Adding 90 degrees to this number, to make 109.5 degrees, yields a triangle (see Fig. 3) seen in many geological situations, a key one being the shape of Easter Island – which could have implications for explaining the island’s mysterious ancient civilisation. It would seem that this model of crop circle formation embodies many of the features identifiable in the physical structure of the cosmos. What seems even more revolutionary, as we shall see, are its implications for living matter. We now turn to what many believe is the key point of interest in the Crop Circle phenomenon. This relates to the many indications of a conscious link between the phenomenon and the human interest in it. On the one hand there is what appears to be a dialogue between the observer and the phenomenon. Every formation will offer a different interpretation to each interested observer. Another factor is the startling degree of synchronicity, revealed in many anecdotes, in which formations have appeared, in particular forms and/or locations, as if in response to human wishes. Is this just imagination, or is it a justifiable fact? Whereas modern scientific method rejects the idea of mind being involved in any physical process, all eras prior to the Renaissance at least considered this to be more than a possibility. In fact, in many philosophies, the human mind was considered to play a direct participatory role in the physical world. This link was severed in the 17th century – largely due to Descartes’ doctrine of the separation of mind and matter. Newton, on the other hand, seems to have re-discovered the ancient Hermetic principle, concerning the link of mind to the cosmos. This however was disguised in allegorical fashion in his non – scientific writings. In the age when the Stone Circles were created, there was evidently a deep spiritual relationship between human kind and the all-providing earth. It seems that daily involvement with earth energies was a central fact of life which amounted to a driving force for civilisation. At certain sacred sites, many of which are still evident today, altered states of awareness became an accepted part of the spiritual life. There is evidence to suggest that the ancients could indeed see the whirling flow of earth energies which acquired a mystical description in terms of deities and other entities. Today, only a handful of people retain the ability to see these subtle energy fields. In our time, when the ancient sites offer us only a limited facility to study these energies, the Crop Circle scene is so dynamic that these things become amenable to analysis using the modern toolkit of Science. Some involved in the circle phenomenon have more than a perceived ability to mentally manifest formations – albeit on a still somewhat hit and miss basis. This is perhaps the bottom line to the whole mystery. Especially as, when manifested, the formations` informational content is often highly relevant to those involved. This indicates that some kind of dialogue between observer and the process is taking place. A number of other effects of circle energies on humans have been studied by Lucy Pringle and her co-workers5. In summary, what has been found is that the energy fields have a dramatic effect on the hormone system of humans and animals. Some recent measurements suggest that the pituitary and pineal glands are very reactive to these energy fields. Nausea or elation can be elicited simultaneously within the same formation in different individuals. Time aberrations have also been reported – an effect also well known in Stone Circles. The healing of chronic health problems has been known to occur. For example, after exposure to the energies of one formation for just a few minutes, a lady with a long-standing hearing defect in one ear no longer requires a hearing aid. There have also been cases of post menopausal women having recurring periods after exposure to the energy fields – a possible explanation of the association of fertility rites with certain of these sites. In addition to these effects on humans, there are many recorded other physical effects associated with the circles. Most common are inexplicable misfunctions of electrical equipment such as cameras and mobile phones. Floating balls of light are also well documented. Similar balls of light have been known to occur at ancient sacred sites and also in earthquake areas, where a study of geologic fault zones contributes to our understanding of the phenomenon. Mainstream science has been struggling for many years to understand the relation of mind to matter. Much progress has been made in understanding the brain and its functioning – but this still skirts around the basic problem. Very recently, however, fresh understanding is coming from new concepts in physics, especially Quantum Theory. Several factors are driving us to recognise at least some connection between mind and matter. In particular, the enigma of non-local interactivity leaves one struggling to escape the conclusion that conscious connections exist between apparently separate objects. Thus fundamental particles, having been once together (entangled in the current terminology) when separated, still appear to behave as one, even though there is no way in which information can apparently be passing between them. The world of science is still endeavoring to come to terms with such outrageous behavior! A common everyday example is that of identical twins. To them, it is commonplace for similar happenings to occur to each of them at virtually the same time. If this is considered too speculative, what about Jung`s long term study of the phenomenon of Synchronicity? That there could be an all pervading Mind Field, amenable to analysis using the latest techniques is generating enormous interest for some researchers, but with severe rearguard actions being fought by many others! This reaction is occurring despite the fact that Transcendental Meditation has been very well studied and some of its associated non-local phenomena reported and accepted in the mainstream literature6. Such are the inconsistencies of present day science. In the Crop Circle scenario, we see many features implicit in this emerging new understanding. The phenomenon may well be providing us with a demonstration of the Hermetic Principle. In focusing exclusively on a clockwork universe, science has so far ignored the possible (re)discovery of the Universal Mind. After centuries of reductionism, it is now coming to be appreciated that we interact creatively with the intelligence of the Cosmos. The crop circles are now offering us a new way to experience this great truth. Each year as we see ever more symbols are portrayed in the fields, we hope the phenomenon will continue long enough so that, collectively, we can begin to appreciate that truly everything is connected.